How To: Weatherproof Your Sneakers | Valet. As we move into cooler, less predictable weather, taking care of your sneakers is more of a priority. After all, anyone who's witnessed their new kicks quickly go from crisp and clean to dingy and stain-splattered knows that a little precipitation (or maybe a spilled beer) can ruin your day, not to mention your shoes. As men, we tend to invest in our footwear—not just dress shoes but sneakers too. So you should want to take care of them. Especially now that some of our most beloved kicks are crafted from knit fibers, laser-cut microsuede and even wool. Keep them fresh (and your feet dry) by properly weatherproofing them. Remove the laces from the sneakers. Make sure the surface of the shoe is clean by brushing them off to ensure they're free of any dust and dirt. 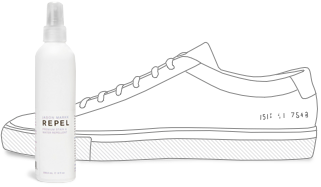 If your canvas or knit shoes are dirty, wash them and make sure they're completely dry before applying the protector spray. 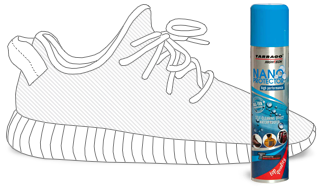 To ensure that your Yeezys, Flyknits or simple canvas sneakers retain their flexibility and breathability, we recommend this innovative spray that utilizes nanotechnology to coat the individual fibers. This makes the material as a whole much more resistant to water and dirt. Keep in mind, this spray does have a potent smell while it's wet, so it's best to spray it outside. We've found that Jason Markk, probably the most trusted name in premium sneaker cleaning, makes one the best protectors that we've tested. This water-based spray creates an impressively durable barrier that works on a wide range of materials and leathers without messing with the color or altering the look or feel of the leathers. Hold the can approximately six inches away from the shoe, and spray the entire area of the shoe's surface, making sure it's completely and evenly coated. Be careful not to oversaturate. Allow the protector to fully cure by letting it dry for at least 24 hours. Then, for best results, apply a second coat and allow that to dry before wearing the shoes. If you want to spray your laces to protect them, we suggest spraying them separately and re-lacing your sneakers after both the shoes and laces have dried. You wear sneakers a lot. Here are some easy ways to keep them looking, feeling and smelling like new. What the in-the-know guy should be wearing right now.